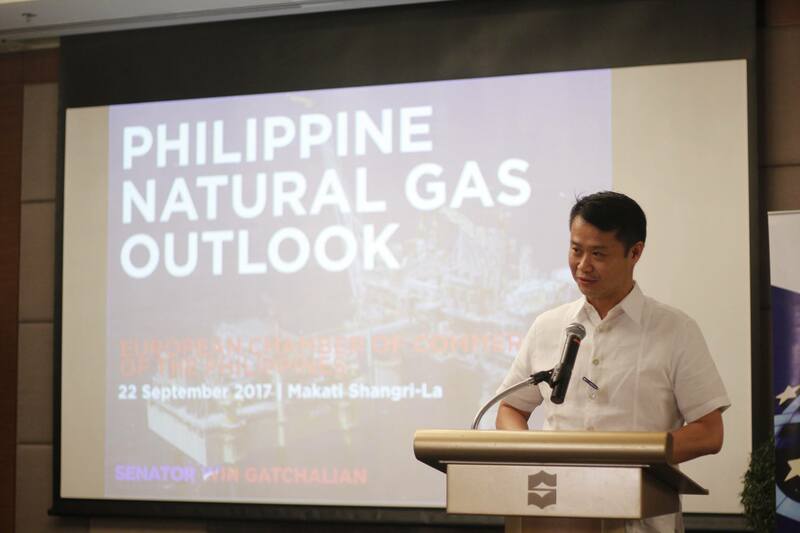 On 22 September 2017, the ECCP had a Luncheon Meeting with Senator Sherwin “Win” Gatchalian, in his capacity as the Senate Energy Affairs Committee Chair. The audience received a presentation from the Senator on the Philippine Natural Gas Outlook, which highlighted the milestone that the Malampaya Power Plants have become, which has displaced expensive fuels, and doubled coal consumption for the past 16 years; and the quarter share of Natural Gas in the Energy Mix. Business as Usual. Let market forces play as usual and decide the path or actions in addressing energy supply. With coal’s inherent cheapness, it may come naturally in the Energy Mix (at current, is at 43 percent). While its use may lead to cheaper electricity rates, coal is not the cleanest energy source, and this situation will increase dependence on imported coal. LNG Terminal Option Onshore Terminal or FSRU. The Senator reported that the Government has been doing feasibility analyses on the possibility of the creation of such terminals in the Philippines. Although LNG is more volatile than coal and would give higher risks for investors, the increase in use of such will lower carbon footprint, in compliance with the country’s international environmental agreements. Aggressive Promotion of Indigenous Resources. From 2016-2030, the Government projects new additional capacity in Hydro and Geothermal energy, with 4752 MW and 1165 MW respectively. In addition to this, wind, biomass, solar, and ocean resources are also looked into for higher energy capacity in the next years. With these sources being highly available in our the country, increase in use will strengthen energy and independence, and lowers carbon footprint, however the Senator also recognizes that developing hydro and geothermal resources is high-risk and will require subsdies and support. With reference to the above presentation, the following Policy Considerations were identified: (1) Energy Security, (2) Public Sector Risk, (3) Commitments: COP21, (4) Retail Prices, and (5) Stranded Cost.